This entry was posted in California, Day/Night Band, Forecast, Suomi/NPP on March 29, 2013 by Scott Lindstrom. The image toggle above shows an area of stratus over central Missouri and surrounding states. The stratus shows up in both the Night-time visible Day/Night band from Suomi/NPP (March 28th is one day past the Full Moon, so there is plenty of lunar illumination, and indeed lunar shadows from the higher cirrus clouds over Illinois, Kentucky and Tennessee are apparent). 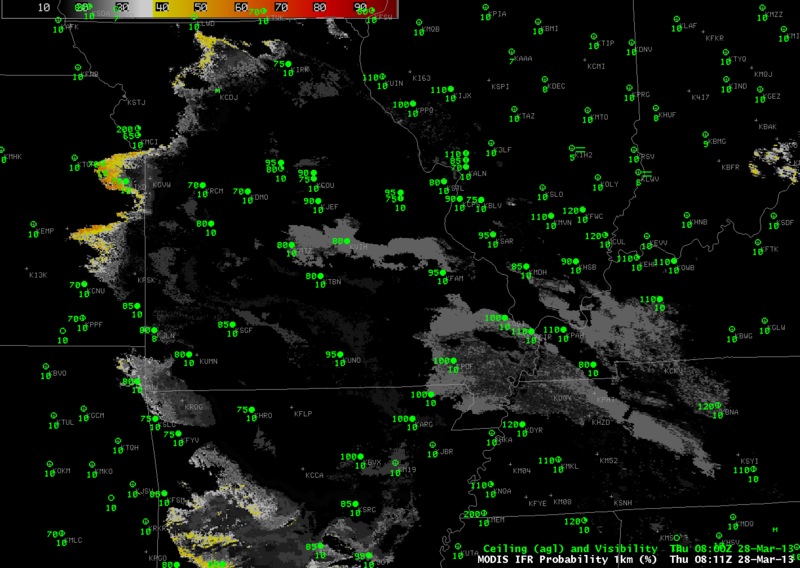 The brightness temperature difference field crisply highlights the region of lower, water-based clouds. That difference field arises from the differences in emissivity properties of the water-based clouds: they emit nearly as a blackbody around 11 µm, and not as a blackbody at 3.9 µm. A key question for this scene is: is this cloud that is depicted stratus at mid-levels, or is it fog? From the top (that is, as the satellite views it), a stratus deck will look very much like a fog bank. The satellite gives little information, however, on how thick the cloud is, or on how close to the ground it sits. 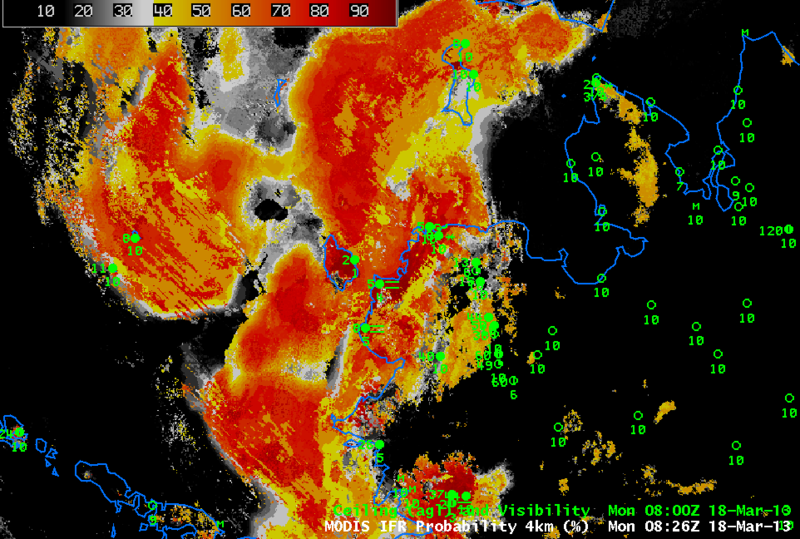 A satellite-only fog detection algorithm, therefore, will include many false positives. IFR probabilities include data about the surface that are incorporated into the Rapid Refresh Model. This fused product clarifies where the brightness temperature difference product is detecting mid-level stratus versus low-level fog. In this case over Missouri, IFR probabilities are very low throughout the scene because saturation at low levels in the Rapid Refresh is not occurring, and therefore IFR probabilities are low. By blending information about the top of the cloud (the brightness temperature difference product) with information about the bottom of the cloud (the Rapid Refresh model data), a more accurate depiction of the horizontal extent of IFR conditions is achieved. This entry was posted in Day/Night Band, MODIS, Suomi/NPP on March 28, 2013 by Scott Lindstrom. A late winter storm moving through the mid-Altantic states was responsible for an episode of reduced visibilities. The loop above shows two areas of reduced visibilities initially — one over the Piedmont of Georgia, the Carolinas and Virginia, and one over the Ohio River Valley. Visibilities decrease as the higher IFR probabilities move in, and, conversely, increase as the higher probabilities move out. IFR Probabilities over southern Ohio, for example, have a character that suggests the probabilities have been computed chiefly with model data. Probabilities are somewhat reduced, and the fields are not pixelated (as they are over the Carolina Piedmont, for example). The animation of the ~0700 UTC IFR Probability and brightness temperature difference field from both GOES-East and from the polar-orbiting Suomi/NPP, above, shows another strength of the IFR Probability product: It screens out regions where high stratus give a signal. The top of a stratus deck and the top of a fog deck may have a very similar brightness temperature difference signal. By fusing the satellite data with a product that includes surface information (such as output from the Rapid Refresh Model), regions with elevated stratus, which clouds do not significantly impact aviation operations, can be removed from the signal. Only regions with actual surface observation restrictions are highlighted in the IFR probability signal above. This entry was posted in Mid-Atlantic, Multiple Cloud Layers, Southeast, Suomi/NPP on March 25, 2013 by Scott Lindstrom. Even though Alaska is at high latitudes, and GOES Imagery there is burdened with degraded resolution, the temporal aspect of the data can give useful information. As an example, consider the animation of GOES-R IFR probabilities near Bethel Alaska along the west coast of Alaska. Note that Bethel AK, in the center (nearly) of the image, is reporting MVFR/VFR conditions, with IFR conditions along the coast — at Kipnuk and Toksook — and offshore at Mekoryuk on Nunivak Island as well as St. George and St. Paul Islands. The fused GOES/Rapid Refresh data is able to delineate correctly the regions with IFR conditions along the coast and offshore from the regions with MVFR/VFR conditions to the east. MODIS data can also give information over Alaska, and the 1-km resolution offers important information. Bethel sits in the region of relatively low IFR probabilities west of the higher probabilities along the coast. This entry was posted in Alaska, MODIS on March 18, 2013 by Scott Lindstrom. 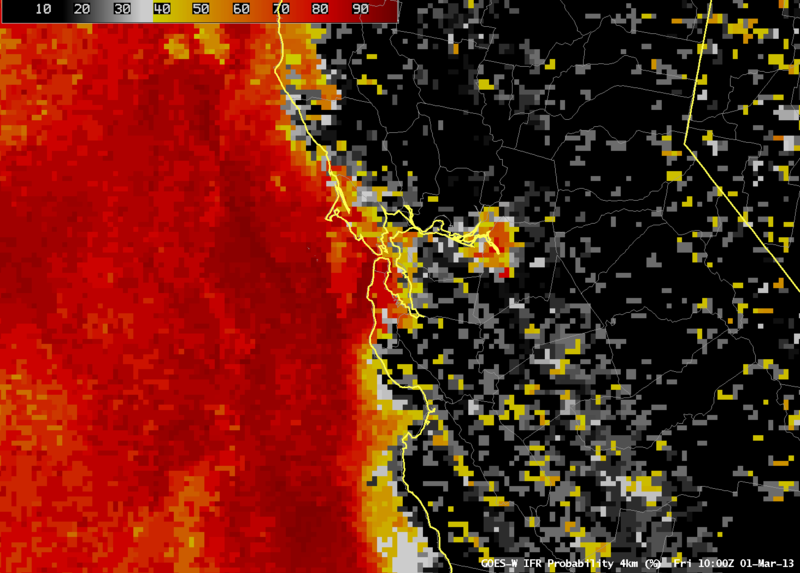 As on top, but with MODIS Brightness Temperature Difference (11 µm – 3.7 µm) in the bottom right. The imagery above underscores the power of higher resolution on fog detection. 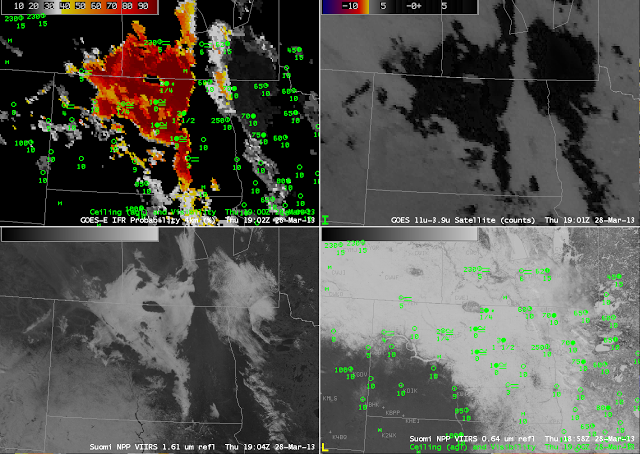 The images on the right side of the images are brightness temperature difference fields, the heritage method for detecting fog and low stratus. The GOES field (top right) actually includes data from GOES-East (eastern Washington and points east — a faint seam is discernible in the image) and GOES-West (western Washington). Pixel size over Washington is large — 6 or 8 kilometers (vs. 4 kilometers at the subsatellite point). In contrast, Suomi/NPP VIIRS data and MODIS data (bottom right) has a resolution of 1 km. 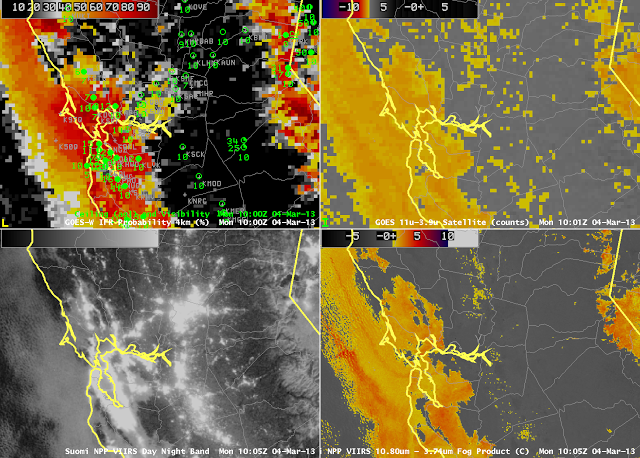 The brightness temperature difference from MODIS and VIIRS more easily resolves the fine-scale structure of the topographically influenced or topographically constrained fog and low stratus. The brightness temperature difference field from GOES is one of the predictors used to generate the IFR Probabilities shown in the upper right. When poor resolution smears out the horizontal domain of the fog and low stratus in the brightness temperature difference field, you might expect a similar effect on the IFR probabilities. MODIS data can be used to compute IFR probabilities. Compare the lower right and upper left figures. High MODIS IFR Probabilities are far more restricted to regions where IFR conditions are observed. In contrast, GOES-based IFR probabilities seem to leak into regions where IFR conditions are not reported. The higher resolution MODIS-based IFR Probabilities (and coming soon, Suomi/NPP-based IFR probabilities) nicely complement the higher temporal resolution of the GOES imagery. Ideally, use of the changes in the GOES-based IFR probabilities shows how IFR conditions evolve over the course of a night. These changes should be tempered with knowledge of the limitations of the horizontal resolution of GOES that are highlighted in the above imagery. This entry was posted in Cloud Thickness, MODIS, Pacific Northwest, Suomi/NPP on March 8, 2013 by Scott Lindstrom. GOES-R IFR Probabilities computed from GOES-West (Upper Left), GOES-West Brightness Temperature Difference (10.7 µm – 3.9 µm) (Upper Right), Suomi/NPP VIIRS Day/Night Band (Lower Left), Suomi/NPP VIIRS Brightness Temperature Difference (10.8 µm- 3.74 µm) (Lower Right), all images near 1000 UTC on March 4 2013. A high-impact fog event on March 1st led to a Group Stop at SFO International. The synoptic conditions that supported fog development on 1 March (Images from 1 March are shown at the bottom of this blog post) persisted through the weekend along the West Coast, and fog was again observed on Monday morning, 4 March and the four images above show results from fog detection schemes for that date. The GOES-R Fog/Low Stratus IFR Probability field shows that the highest probability of IFR conditions is occurring where IFR and near-IFR conditions are observed. 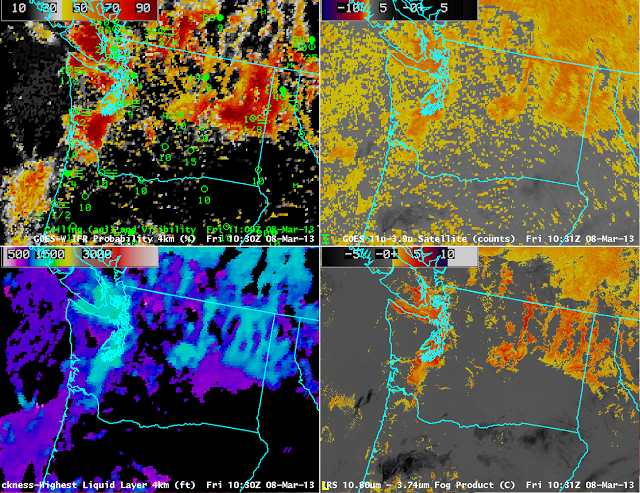 Note the benefits of the high-resolution Suomi/NPP VIIRS data. Sharp edges to the low cloud field are ably captured in central Santa Clara County. There are also benefits to using the near infrared and infrared channels to detect regions of low clouds in urban areas, where bright lights can dazzle the Day/Night band so that small breaks in the clouds, as detected just south and west of southern San Francisco Bay, cannot be discerned in the visible. Compare the differences in the 1-km data from VIIRS to the nominal 4-km resolution of present GOES in the imagery above. Note also that the brightness temperature difference helps distinguish between snow and clouds over the Sierra Nevada. The animation, above, of GOES-R IFR Probabilities helps describe and define the region of evolving IFR conditions early on March 4th. Figures provided by Warren Blier, WFO MTR. Warren Blier from NWS in MTR sent along an email about the event on March 1st. 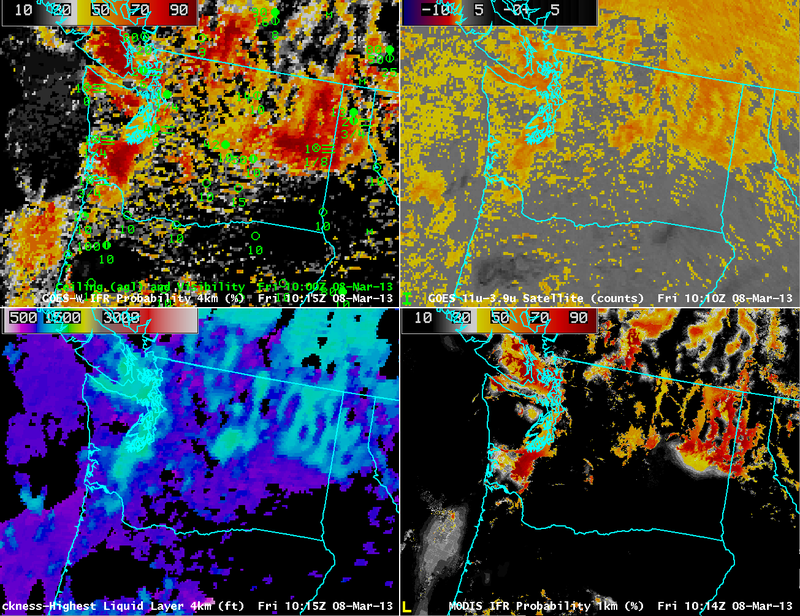 The screen capture above shows MODIS-based GOES-R IFR probabilities (on the right) compared with the GOES-West ‘traditional’ unenhanced brightness temperature difference. The higher spatial resolution of MODIS and of VIIRS really does pick up the details. The image below is the 1000 UTC image created using GOES-West data, and the comparison between the MODIS image above and the GOES image below shows the power of MODIS resolution. An animation of GOES-R IFR probabilities from 0000 through 1600 UTC on 1 March shows the highest IFR probabilities increasing near SFO after 0900/1000 UTC on the first. This entry was posted in California, Day/Night Band, Suomi/NPP on March 4, 2013 by Scott Lindstrom.